Home / All Posts / Reluctant Writers / Stumbling block #9 – What’s the point? Sometimes, your teen’s opposition to writing has nothing at all to do with laziness, procrastination, perfectionism, or confidence—and everything to do with relevance. In other words, she resists writing because she wonders: What’s the point? This brings us to today’s article in the series on 10 Stumbling Blocks to Writing. Problem: (1) Your student can’t see a purpose for the assignment itself, or (2) she can’t understand why she has to go through all the steps of the writing process. Solution: (1) Make writing assignments relevant, and (2) help your student see the value of refining her work. Though it’s nice to give our children choices and options, the kind of writing (such as a short report, book summary, or compare/contrast essay) — and even the specific topic of that composition — will be dictated to them from time to time. Like it or not, sometimes they have to write on a subject of our choosing, and there’s just no way around it. Still, for the most part, students are more willing to write if the assignment feels purposeful. Writing for writing’s sake—to describe a sunset, for example—may not motivate them at all. But writing as it applies to their Civil War studies or a lesson on botany will make more sense to them—and may even spark enthusiasm—especially if it’s a subject they love. So whenever possible, look for ways to tailor the topic to your students’ interests and passions. After all, the more relevant the writing assignment, the more likely they’ll cooperate. Getting kids to write can be challenging enough, but getting them to embrace the whole writing process is another thing altogether. Each step of the writing process is vital, from brainstorming to final draft, but students often think of these “extra steps” as time wasters. Editing, revising, and rewriting, for instance, can be downright painful—for both of you! Most kids hate this part of the writing process. They like what they wrote; therefore, they’re highly resistant to making any changes. Regardless of how loudly, tearfully, or convincingly they protest, this is a necessary part of the writing process, and something all writers—including your children—have to do. Illustrate how other skills require many steps too, and how these steps are quite similar to the prewriting, brainstorming, drafting, and revising that comprise the writing process. For instance, playing a musical instrument, a sport, or a video game requires investment of time and a working out of many steps. After all, how do you get to a new skill level except by practice? This makes perfect sense to your teen. She can also grasp that in order to create a new recipe, a chef has to prepare a dish several times so he can figure out how to improve it. Is it too bland? Too dry? Could it use a topping? Is the texture pleasing to the palate? How would it taste with less salt? More vanilla? The chef tastes each batch, adds or removes seasonings, and adjusts ingredient quantities. When he’s satisfied, he prepares the dish for others and asks for feedback. Then it’s back to the test kitchen once again! A chef would never add an untested item to his restaurant’s menu until he’s sure it’s the best it can be. Refining and perfecting his recipe is a process, and it takes time and patience. Would your child dream of playing a brand-new or unfamiliar sonatina at her piano recital? Of course not! It’s the piece she’s practiced and refined that she feels more comfortable presenting. Similarly, no author ever publishes his first draft. His book or article goes through repeated self-editing—and numerous revisions—before he feels ready to submit it to his editor, who in turn adds his own suggestions for improvement. Your child would not enjoy her favorite novels nearly as much had a wise editor not repeatedly put the author through the steps of the editing process. Remind your resistant writer that she goes through the writing process with a goal in mind: the final draft. After all, it’s not the rough draft that becomes her published writing project; it’s the polished and revised version that she’ll want to share with others. Once she’s gone through the revising process, ask her to compare her first draft with the final version. When she can see the progress she’s made from that rough beginning to her very best attempt—the final draft, the purpose for the steps in the writing process becomes clearer. Hopefully this means less whining as she learns to approach the steps of the writing process with an improved attitude! Next week we wrap up our 10 Stumbling Blocks to Writing series with a special focus on special needs: Stumbling Block #10– Learning Challenges. Share a comment: Which step of the writing process does your child most resist—brainstorming, writing, or revising? 2010 © Kim Kautzer. All rights reserved. The Teacher’s Manual for WriteShop I and WriteShop II includes ideas for writing across the curriculum. Suggestions for applying each lesson’s skills to a topic of current study appear in Appendix B. An important reminder and a great object lesson with the recipe. Editing is always a struggle here. You’re certainly in good company, Diane. I think the editing struggle is universal, which is why I’m always on the lookout for ways to make the idea relevant to the kiddos. In my son’s French book he had to write some recipes directions once. He loves to cook so it went smoothly. 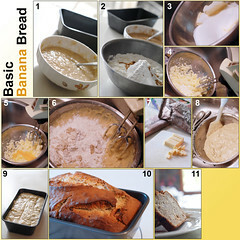 I love the picture with the steps to write for the Banana bread. Wish I could take credit for the banana bread photo collage, Isabelle. I use Flickr (Creative Commons) for the majority of my blog photos. For my reluctant highschooler, who insisted on relevance, I promised no more writing assignments if he had an article published in Fine Woodworking Magazine. (He is a fine woodworker.) He did not do this but he did have several letters to the editor published in the local newspaper when he read topics that he had strong opinions on. Was his education adequate? I always questioned. Then, this year, he took his first college class, earned a 98% on his research paper and an A in the class. Carol: What an encouraging testimony! I love the “carrot” you dangled before your son. So creative! You sound like a very wise mom. Thanks for the hint of having the student read the first draft and then the final draft. I will try this with my daughters and hopefully they will better see why we go through all the steps. Thanks again. These “stumbling block” articles have been helpful. You’re so welcome, Tammy! I’m glad you’ve found encouragement and help through the 10 Stumbling Blocks series.